The publication history of The Double Hook is epic and obstacle-strewn! Rejected by a Who's Who of the 1950s publishing world: Cecil Day-Lewis, T. S. Eliot and Rupert Hart-Davis all turned it away, along with American publishers Random House, Harcourt-Brace, Knopf, New Directions and Atheneum. The consensus seems to have been that although not without merit, The Double Hook would be virtually unsaleable. Canadian Jack McClelland took a chance and against the odds The Double Hook has never been out of print since its 1959 publication. Greta was at the stove. Turning hotcakes. Reaching for the coffee beans. Grinding away James's voice. James was at the top of the stairs. His hand half-raised. His voice in the rafters. James walking away. The old lady falling. There under the jaw of the roof. In the vault of the bed loft. Into the shadow of death. Pushed by James's will. By James's hand. By James's words: This is my day. You will not fish today. The Double Hook begins with the murder of "the old lady, mother of William of James and of Greta," after which various neighbours see her in the river during the day. A large cast of characters people the novel, each with a story - a true ensemble cast - and they move in and out of the scenes interwoven and entwined with each of the other characters. At times, the writing seems to be depicting life in a dream in which only certain scenes and symbols are evident, and we have to piece together the characters' motivations, and sometimes even the plot, like a puzzle. I have to admit that for me, this novel would require more attention than I feel compelled to give it right at this moment. It is not that I didn't like it. It is just that, for me right now, it is less a story to enjoy reading, and more a novel to study with a notepad and highlighters (perhaps multi-coloured) to fully appreciate its complexity and weight. When the mood is right and I do feel in the mood for digging deeper, this will be the book I pull off the shelf. 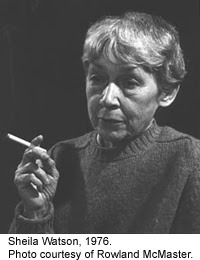 Mrs. Watson is a small, bird-like creature who lives on coffee and cigarettes. Charming, sly, humorous, she deals like Eliot's Madame Sosostris "a wicked pack of cards." The reader must pick up his hand and play it with intelligence and perception, and if he does will find her writing among the most rewarding ever produced in this country. With The Double Hook she indubitably takes her place in the forefront of Canadian literature. 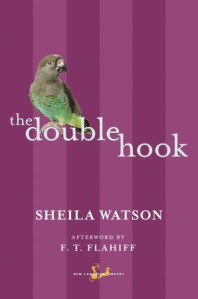 Here is an article about the publication history of The Double Hook; Sheila Watson's bibliography; and a fascinating glimpse at a contemporary review here. Thanks for your comment! I am glad to know you found it challenging too! I do intend to return to this when I'm in a more pensive mood. I suspect it will reward much re-reading and much contemplation.